Acupuncture is a healing method that was first used by the ancient Chinese over 4000 years ago. According to Traditional Chinese medical philosophy, disease is a result of a disruption or imbalance of the Vital Energy/life force known as Qi (pronounced "Chee".) Qi flows through the body via meridians. These meridians are channels of energy that form a network to connect all the parts of the body. Qi is gathered and distributed at acupuncture points. Insertion of fine needles into these points helps to rebalance the flow of Qi and restore health. When the Acupuncture point is stimulated, there is a release of many natural substances including hormones and neurotransmitters. These chemicals, such as endorphins and serotonin, help decrease pain and muscle spasms, increase blood flow, stimulate nerves, and often promote a sense of calmness. Acupuncture is virtually painless for most patients. It is most often performed with very thin, sterile, stainless steel needles. Most patients don't react at all to the needle placement. Once the needle is passed through the skin, the patient does not feel the needle but may feel a tingling, numbness or warmth. Most patients relax once the needles are in place and some will even fall asleep. Yes. 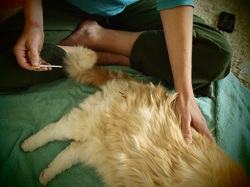 Acupuncture is one of the safest therapies available for our pets when performed by a properly trained veterinarian. Serious side effects are rare. How often are treatment sessions and how long do they last? Can Acupuncture be used for preventative care? Most disease processes start with subtle imbalances in the body. Acupuncture can be a gentle and effective way to help the body restore it's energetic balance. Thus, the acupuncturist can use a preventative medical approach to allow the patient to reach and maintain a more optimal level of health and wellness. Acupuncture can be used on its own or in conjunction with Western medicine to treat a variety of medical problems. • Musculoskeletal disorders such as arthritis, hip dysplasia, and muscle spasms. and certain types of paralysis. • Urinary disorders such as incontinence, chronic urinary infections, and kidney disease (chronic and acute). • Respiratory disorders such as sinusitis, asthma and coughing. • Gastrointestinal disorders including vomiting, inflammatory bowel disease, diarrhea and constipation. • Dermatological disorders such as allergic dermatitis and chronic skin disease. • Cardiovascular diseases which include valvular disease and cardiomyopathy. • Pre and post-surgically to manage pain and hasten healing.